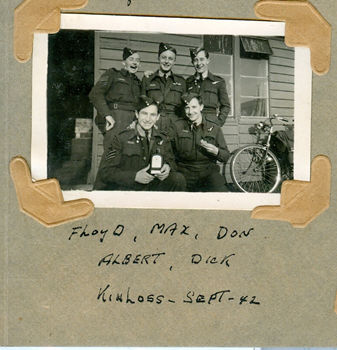 Floyd Wile and colleagues at 19 OTU, RAF Kinloss, September 1942. Four aircrew in this picture would later take part in the Dams Raid. Back row, L-R, Floyd Wile (navigator), Max Stephenson (pilot), Don Hopkinson (bomb aimer). Front row, L-R, Albert Garshowitz (wireless operator), Richard Bolitho (air gunner). From Albert Garshowitz’s photograph album. Pic: Garshowitz family. Floyd Wile was born on 17 April 1919 in Scotch Village, Nova Scotia, Canada and worked in the timber trade after leaving school. He enlisted in the RCAF in May 1941 and was selected for training as a navigator. He qualified as an Air Observer in February 1942. After further training he was posted to Britain, and arrived in May 1942. He was sent to a further training unit at RAF Kinloss and crewed up with pilot Max Stephenson, wireless operator Albert Garshowitz, bomb aimer Don Hopkinson and gunner Richard Bolitho, flying Whitleys. The picture above was taken sometime in September 1942, during this period. The crew were then posted for further training on heavy bombers and Frank Garbas and John Kinnear were added to the crew. When they were ready for operational flying, the whole crew were posted to 9 Squadron and Wile received a commission. However, before they could fly together Max Stephenson was sent to gain operational experience on a trip to Duisberg, flying as flight engineer. Unfortunately his aircraft was shot down, and he was killed. Without a pilot, the crew was then shipped to 57 Squadron, and allocated to Bill Astell and flew their first operation to Lorient on 13 February 1943. After several more operations, they were posted together to the new 617 Squadron. Sadly, Wile and his colleagues were all to die on 617 Squadron’s first operation, when their Lancaster was damaged by flak and collided with a pylon near Marbeck. They were buried first in Borken, and reinterred after the war in the Reichswald Forest Military Cemetery. Thanks to Floyd Wile’s nephew, Don Lightbody, for help with this article. I am in fact writing about him on my article site. It will be up within the next couple of days. Its Nell Rose Hubpages, if you are interested.